The AAS Laboratory Astrophysics Division (LAD) is awarding its 2018 Laboratory Astrophysics Prize to Michael Wiescher of the University of Notre Dame, Indiana, for his leading contributions to the experimental foundation of nuclear astrophysics and for bridging experiment and theory in this dynamic field. The Laboratory Astrophysics Prize, LAD’s highest honor, is given to an individual who has made significant contributions to laboratory astrophysics over an extended period of time. For decades Wiescher has pioneered experimental techniques to reproduce conditions that drive explosive nucleosynthesis in novae and X-ray bursters, significantly advancing our understanding of the evolution of accreting white dwarfs and neutron stars, respectively. He combines pathbreaking laboratory techniques with insightful theoretical modeling to study nuclei produced in a variety of astrophysical scenarios. For example, he demonstrated the need for radioactive ion beams to investigate explosive nucleosynthesis and developed a deep underground accelerator laboratory to study nuclear reactions in quiescent stellar burning like that going on deep inside our own Sun. Wiescher received his PhD from the Institute of Nuclear Physics at Münster University and is the author of nearly 400 publications in nuclear physics and astrophysics. 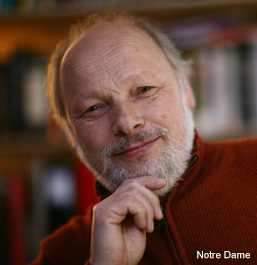 Previous honors include Fellowship in the American Physical Society (APS) and the American Association for the Advancement of Science, the Presidential Award of the University of Notre Dame, and the APS Hans Bethe Prize. He serves on a number of national steering committees for nuclear and particle astrophysics and was recently elected to the European Science Academy. He directed the Joint Institute for Nuclear Astrophysics from 2003 to 2016 and now leads the Nuclear Science Laboratory at Notre Dame’s Institute for Structure and Nuclear Astrophysics. He has trained several graduate students who have gone on to prominent careers in nuclear physics and nuclear astrophysics. The LAD Laboratory Astrophysics Prize includes a cash award, a framed certificate, and an invited lecture by the recipient at a meeting of the Laboratory Astrophysics Division.